The Yarmouth-Freeport varsity girls hockey team battled hard to win their third straight game against an aggressive Greely/GNG team. Six different players scored tonight and five others picked up assists for a 6-3 win. Sophomore goal tender Allie Perrotta was solid in net and turned away several strong shots from Greely’s top scorers and made some stellar saves to give Yarmouth-Freeport their first win other Greely in several years. 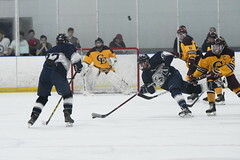 Scoring started early for Yarmouth-Freeport when Rinaldi found the back of the net with help Guertler and Weinrich a minute and a half into the game. 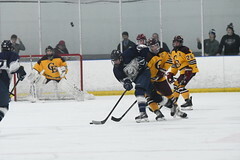 Greely scored a couple of minutes later on a power play, after Guay was sent to the box for a hook, to tie the game at 1-1. Greely would put on more in the net after goal tender Allie Perrotta made the first and second save by putting the puck top shelf in a messy scramble in front of the net. 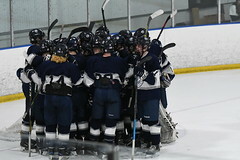 Yarmouth-Freeport came out strong in the second period scoring four unanswered goals. Arruda was the first to score in the second with assists going to defenders Grondin and Swift. Next to find the net was Lily Caulfield, Guertler picking up another assist, for her first goal of the season. Moll also scored off of a rebound from Grondin, and Bradford put one more in the net with five minutes to go in the second to give Yarmouth-Freeport a 5-2 lead heading into the third period. Despite a hard battling and chipping third period Greely team, the Yarmouth-Freeport girls stayed focused and continued to defend their lead. Greely put one in the net six minutes into the third on another power play when Newberg was sent to the box for tripping, but Guay answered a minute later driving to the net and scoring off a rebound from Bradford. Greely was called for a roughing penalty with 4:31 to go in the game giving Yarmouth-Freeport their first power play opportunity, but a hook from Moll made it four-on-four a minute later. Greely pulled their goalie and added pressure to Yarmouth-Freeport, playing six on four once their penalty expired but were unable to score.